R Gupta, S Canty, W Ryan. Anterior knee pain following total knee replacement caused by isolated Paget's disease of patella. The Internet Journal of Orthopedic Surgery. 2007 Volume 9 Number 2. We as a routine do not resurface the patella during a total knee replacement in our hospital. I present below a case where we had to do so because the patient developed anterior knee pain following a total knee replacement that was diagnosed as arising from isolated Paget's disease of the patella. Whether to resurface the patella during total knee replacement (TKR) still remains controversial. There are proponents for routine patellar resurfacing, for not resurfacing and for selective resurfacing. The results of randomised prospective controlled trials are unable to provide clear guidelines to recommend routine resurfacing of the patella. We as a routine do not resurface the patella during a total knee replacement. I present below a case where we had to do so because the patient developed anterior knee pain following a total knee replacement that was diagnosed as arising from isolated Paget's disease of the patella. He underwent an uneventful cemented Kinemax Plus total knee replacement without patella resurfacing in March 2004. Post operative follow-op showed improvement in patients walking and satisfactory implant alignment & cementation [ Fig 2 ]. Follow-up in nine months showed persistence of pain in the knee with ROM from 10-40 degree. There were no clinical suggestion of infection and inflammatory markers were within normal range. A year following his symptoms persisted and his knee was still painful. Bone scans and radiographs done showed some loosening and a diagnosis of low grade infection was made. He underwent a one stage revision knee replacement in May 2005 with a Stryker Scorpio total knee stabilization system. His tissue samples did not grow any organisms. A possible mechanism may be related to the contact of degenerative or damaged patellar cartilage against the femoral component. Pain fibres are absent in healthy, articular cartilage but have been identified in degenerative cartilage. It has also been suggested that AKP may be due to an increase of the intraosseous pressure in a degenerative patella, especially during flexion which may compromise the circulation in the subchondral bone leading to pain. These two hypotheses suggest that resurfacing of the patella would eliminate this complication but AKP may still be identified in 5% of patients who undergo primary TKR with patellar resurfacing. Resurfacing of the patella was not a feature of many early designs of total knee prostheses. The occurrence of postoperative patellofemoral pain, particularly in patients who had rheumatoid arthritis, resulted in the incorporation of patellofemoral resurfacing into most subsequent designs. With the advent of modern condylar components, resurfacing of the patella became a standard part of total knee arthroplasty. 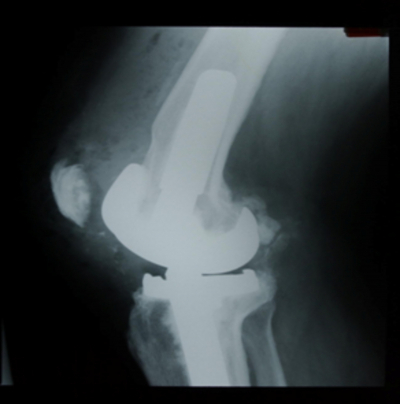 However, complications related to the patella emerged as the major cause of reoperations after total knee arthroplasty. These complications included postoperative anterior knee pain, subluxation, dislocation, patellar fracture, rupture of the quadriceps tendon or the patellar ligament, and patellar clunk. Because many of these patellofemoral complications seemed to be more common after the patella had been resurfaced, so-called selective resurfacing was suggested as a means of lowering the prevalence of complications after total knee arthroplasty. 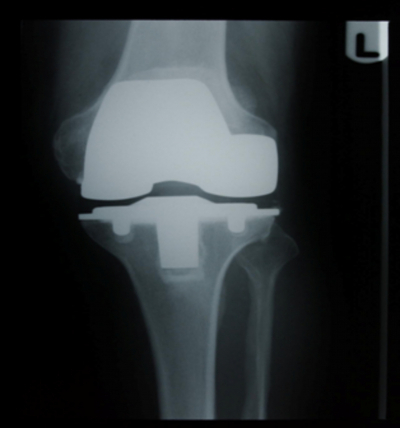 Whether to resurface the patella during total knee replacement (TKR) remains controversial. There are proponents for routine patellar resurfacing, for not resurfacing and for selective resurfacing. Routine patellar resurfacing appears to be an option to reduce patellofemoral-related pain, but prospective randomised trials have not provided consistent results in the short- to medium-term. Emilios E Pakos et al (6) in their meta-analysis of patella resurfacing concluded that evidence indicates that patellar resurfacing reduces the risks of reoperation and anterior knee pain after total knee arthroplasty. The observed effects are clinically important despite their modest magnitude. Additional, carefully designed randomized trials are required to strengthen there claim as suggested by them. Boyd et al (2) compared the results, at a mean of 6.5 years postoperatively, for 396 knees that had had resurfacing of the patella and 495 knees that had not had resurfacing. Their patients had had selective resurfacing on the basis of the appearance of the patella at the time of the operation. The authors recommended resurfacing of the patella both for patients who have degenerative osteoarthritis and for those who have inflammatory arthritis. Wood et al(4) reported their results of a randomized prospective trial of patella resurfacing in 220 primary TKAs, and they also found no difference between the groups with regard to Knee Society scores. They found higher anterior knee pain scores in the non-resurfaced group (31% versus 16%). Campbell et al (5) in their ten year randomised prospective trial involving 100 patients hypothesised that patellar resurfacing would influence the disease-specific outcome of osteoarthritic patients undergoing knee replacement. They observed that there was no difference in the knee scores between these two groups. The results of the above randomised prospective controlled trials are unclear in recommending routine resurfacing of the patella. In view of this lack of convincing evidence recommending patella resurfacing and the complications associated in doing so we are justified in our decision not to routinely primarily resurface the patella. The indications for secondary resurfacing include persisting post-operative anterior knee pain and inflammatory arthritis affecting the patella. Evidence of isolated hot patella on bone scan suggesting pathology affecting only the patella could be an indication for resurfacing the patella. Residual anterior knee pain after TKR is a common cause of early revision surgery, but resurfacing the patella in these circumstances may not relieve the symptoms. Importantly, there are fewer treatment options available for patients who have already had resurfacing of the patella. There is evidence to suggest that secondary resurfacing results are generally poor. Berry and Rand (1) found that isolated revision of the patellar component is fraught with complications. Fourteen (39 per cent) of thirty-six such revisions in their study were associated with major complications that compromised the result. In a related study by Leopold et al (8) 41 knees underwent isolated patella revision for radiographic loosening or patella subluxation. Failure occurred in 38% of patients, and 8 patient's required additional surgery at a mean of 48 months after isolated patella revision. The authors concluded that isolated patella revision was associated with a high reoperation rate and a relatively low rate of success. There have been total knee arthroplasties performed for Paget's disease of the knee (1,9). There have been no mention whether patella were resurfaced in these cases. The literature to date shows that TKA for Paget's disease provides comparatively good long-term outcome. 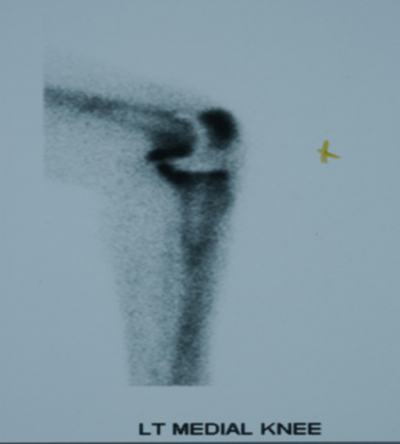 However, technical difficulties can occur during surgery, and radiolucencies at the bone-cement interface may develop. Exposure of the Pagetic knee has been described as difficult and leading to complications of the patellar tendon attachment (3,7). The combination of soft-tissue contractures and a thickened patella can complicate eversion of the patella. If the Paget's disease involves the patella, eversion may be difficult with possible injury to the patellar tendon. In these cases, the patella should undergo preliminary preparation resecting its articular surfaced and any peripheral osteophytes or extra bone. We have been unable to identify any cases in the published literature of secondary resurfacing for Paget's disease. Our case illustrates the importance of patella resurfacing in inflammatory diseases. 2. 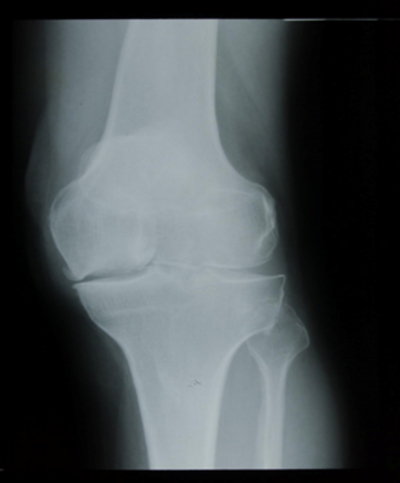 Boyd, A. D., Jr.; Ewald, F. C.; Thomas, W. H.; Poss, R.; and Sledge, C. B.: Long-term complications after total knee arthroplasty with or without resurfacing of the patella. J. Bone and Joint Surg., 75-A: 674-681, May 1993. 6. Emilios E Pakos, Evangelia E Ntzani, Thomas A Trikalinos. Patella resurfacing in total knee arthroplasty: a meta-analysis. JournalofBoneandJointSurgery. (Americanvolume).Boston:Jul2005.Vol.87, Iss. 7; pg. 1438, 8 pgs. 7. Gabel GT, Rand JA, Sim FH. Total knee arthroplasty for osteoarthrosis in patients who have Paget disease of bone at the knee.J Bone J Surg Am. 1991; 73:739-744. 9. Pascal A Schai, Richard D Scott, Alastair S E Younger. Total kneearthoplastyinPaget'sdisease:Technicalproblemsandresults. Orthopedics. Thorofare: Jan 1999.Vol.22, Iss. 1; pg. 21, 5 pgs.